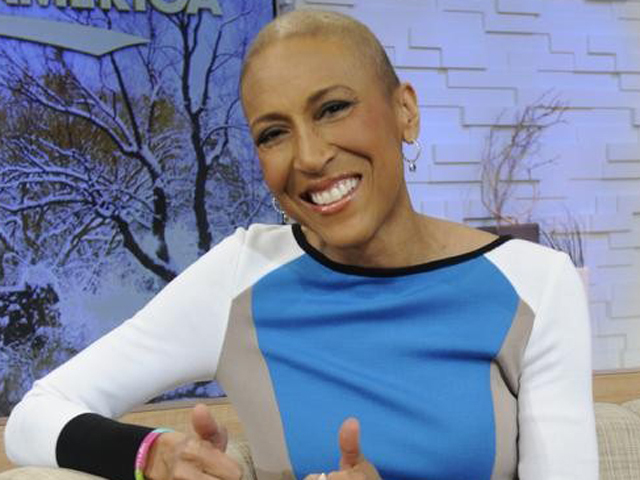 Robin Roberts has returned to the "Good Morning America" set for the first time since her bone arrow transplant in September. Although she didn't appear on camera, the TV host arrived Thursday at 5 a.m. ET for a test run. It marks the first of a series of trial runs Roberts will make before returning to the morning show in February. "What a thrill to be back at 'GMA's' Times Square Studio this morning and see the best folks in the world, my 'GMA' family," Roberts said, according to ABC News. "I can't wait to get back to the anchor chair in a few weeks." Roberts, 52, got the go-ahead from doctors after her latest tests had no abnormalities. "My doctors want me to see how many people I actually come in contact with. How my body reacts to the stimulation, that's code word for stress, of being in the studio environment," she said. "My skin is very sensitive and so we have to see how it reacts to the studio lights. My vision is still a little blurry from the treatment," she added "All of this is getting better day by day so that is the next step." Roberts had a bone marrow transplant to treat myelodysplastic syndrome, a rare blood disorder that affects the bone marrow. Roberts, who has already battled breast cancer, announced the news in June and started her leave of absence in August. Her sister, Sally-Ann, served as the donor.